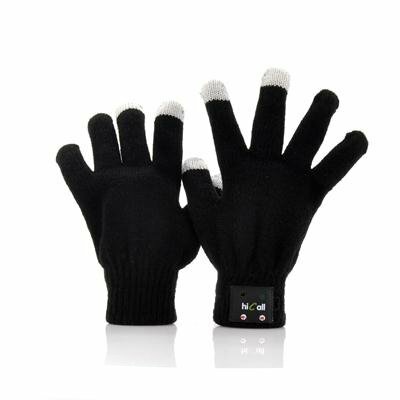 Successfully Added Hi-Call Bluetooth Talking Magic Gloves For Women - Built-in Speaker + Microphone to your Shopping Cart. Bluetooth Talking Magic Gloves has been designed for Women, which boast a Built-in Speaker and Microphone so that you never miss a call again. Designed and manufacturer with women in mind, these Hi-Call gloves for women are ideal for ensuring your fingers don’t suffer from frostbite when searching for you phone in your handbag when its ringing during the harsh winter months. Made from a combination of Polyacrylonitrile, Cotton and Polyster, these gloves really provide an extra benefit of being able to answer and disconnect from calls as well as being able to walk about as you talk via the glove. Sounds strange? Well, remember when you were a child and you mimicked that you were on the phone with the thumb being the speaker part and your little finger as the speaker, the Hi-Call operates in a similar fashion. To enable this operation you will need to pair the smartphone to the glove by simply turning on Bluetooth and pairing up using the simple ‘0000’ password. The Hi-Call uses Bluetooth version 3.0 and EDR, and as a result you will have a more stable ad solid connection plus you will have a transmission distance of up to 12 meters allowing plenty of space between you and your device. With an 110mAh rechargeable lithium battery built-in, the Hi-Call glove has a continuous talking and usage time of up to 10 hours, so when the power is running low you can then easily recharge it with the accompanying cable that is part of the package. These gloves are truly great for any woman wanting to hit the high streets for Christmas shopping or going on a winter vacation to the French Alps where the weather can be a bit nippy, the Hi-call will provide you an assistance that will noticeably become more convenient once put to use. Never again with you desperately raid your handbag or force your hand into your tight jeans when your phone is calling as now the Hi-Call provides the ease if just pressing the button and talking directly via your pinky finger. Talk to the hand with these awesome Bluetooth pairing magic gloves that are known as the Hi-Call. This product is in stock and can be dispatched within one working day of ordering with a 12 month warranty. Brought to you by the leaders in wholesale electronics and cool gadgets, Chinavasion. .